The Chilli Up North shop isn't quite ready, but once it is you will be able to buy all sorts of chilli goodies at great prices. 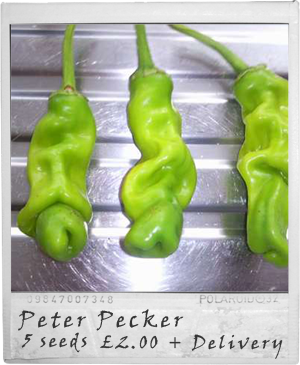 In the meantime I have a few spare packs of Peter Pecker Pepper seeds left, they are the ones that grow to resemble, well you guessed it a male pecker/todger/willy. They ripen from green to red...although this can't be guaranteed. They make a great talking point, are easy to grow and are edible, if you would like some then please use the link below. Please Note if you are from outside the UK then I cannot send the seeds to you.